Posted on: August 27, 2015 By: Christopher Brown, Esq. In Virginia, accidents in stores or business properties is considered a premises liability case. This is because the injured party must prove the owner or landlord was negligent and that the negligence caused the accident. Property owners are generally responsible for accidents caused because of unsafe building conditions, such as a water leak. Landlords are generally responsible for accidents caused because of unsafe actions, such as failing to cordon off a waxed floor. Every slip and fall case will involve key questions, such as what caused the unsafe condition and why the owner did not take any corrective action. The article below introduces the various legal theories regarding slips and fall accidents on business properties. Proving fault/negligence because of an accidental slip and fall on a business property is a complex process.There are only two ways that a business is liable for slips and falls on their property. First, the business was negligent. Second, the negligence caused the slip and fall. Therefore, an unsafe condition must be the primary cause of the slip and fall. In addition to this, it must be proven that the defendant knew of, or should have known of, the unsafe condition. Who can be sued typically depends on the details of the alleged negligence. Normally, the defendant would be the business owner. For example, if you slip because of a structural problem related to the building, such as a broken water pipe or leaky ceiling, then the property owner would be liable. To learn more about accidents on dangerous property, visit here. However, if the property is leased, then then the landlord may be liable. For example, if you slip because the landlord did something, or failed to do something, then the business owner would be liable. 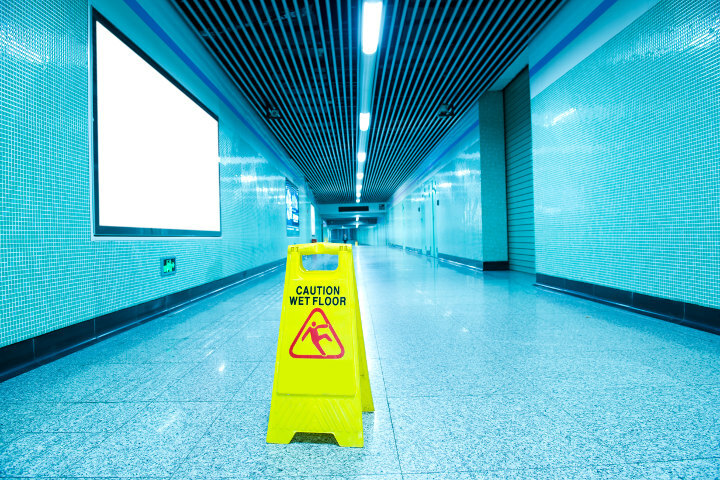 For example, if a store employee failed to post a safety cone or warning sign on the freshly mopped or waxed floor, any slips or falls would be claimed against the store owner. Was the floor excessively slippery? What caused the floor to be slippery? Was there a posted warning about the slippery floor? Did the owner or landlord know that the floor was excessively slippery? Should the owner or landlord have known that the floor was excessively slippery? Did the injured individual know that the floor was slippery before the accident? If a foreign substance caused the slipperiness, how long had it been on the floor before the accident? Why Was the Floor Excessively Slippery? How Long Had the Floor Been Slippery? A slippery floor case can only be won if you prove the defendant knew or should have known that the floor was excessively slippery. The longer that floor was slippery, the better your chances are at proving that the defendant should have known about it and fixed it. However, if a shopper in a grocery store slips on a fruit peel that someone else just dropped, the store will most likely not be liable. This is because there was insufficient time to learn about and correct the problem. However, if the fruit peel had been lying on the floor for 20 minutes, then you most likely can sue the supermarket. Slippery floors are sometimes unavoidable. For instance, business owners will regularly mop or wax the floors. Therefore, the “reasonableness” standard will apply to the negligence case. That is, the employee should close off the area or post a warning sign. However, posting signage does not completely clear the owner or landlord of negligence. If you have experienced a slip and fall at a business property because of negligence, be sure to contact our firm for legal assistance. Any person injured because of a slip and fall accident must immediately determine and document the exact cause of the unsafe condition. Otherwise, the chances of successfully suing the business owner or landlord will be severely limited. After you slip and fall in a store or business, determining whether or not you can file a lawsuit can be difficult. If you have been involved in an accident in a store or business property – contact The Brown Firm PLLC immediately. Our firm’s experienced premises liability attorneys understand property negligence and will assist you through every step of the litigation process. We understand that pursuing a lawsuit is a serious decision. This is why our firm offers free initial consultations by phone or at our office. To discuss your case or, to set up a free consultation – call our firm or send our attorneys a message online.